JEV is generally spread by mosquitoes, specifically those of the Culex type. Pigs and wild birds serve as a reservoir for the virus. The disease mostly occurs outside of cities. Diagnosis is based on blood or cerebrospinal fluid testing. Prevention is generally with the Japanese encephalitis vaccine, which is both safe and effective. Other measures include avoiding mosquito bites. Once infected there is no specific treatment, with care being supportive. This is generally carried out in hospital. Permanent problems occur in up to half of people who recover from JE. Severe rigors may mark the onset of this disease in humans. Fever, headache and malaise are other non-specific symptoms of this disease which may last for a period of between 1 and 6 days. Signs which develop during the acute encephalitic stage include neck rigidity, cachexia, hemiparesis, convulsions and a raised body temperature between 38–41 °C (100.4–105.8 °F). Mental retardation is usually developed. Mortality of this disease varies but is generally higher in children. Transplacental spread has been noted. Lifelong neurological defects such as deafness, emotional lability and hemiparesis may occur in those who have had central nervous system involvement. In known cases, some effects also include nausea, headache, fever, vomiting and sometimes swelling of the testicles. Increased microglial activation following Japanese Encephalitis infection has been found to influence the outcome of viral pathogenesis. Microglia are the resident immune cells of the central nervous system (CNS) and have a critical role in host defense against invading microorganisms. Activated microglia secrete cytokines, such as interleukin-1 (IL-1) and tumor necrosis factor alpha (TNF-α), which can cause toxic effects in the brain. Additionally, other soluble factors such as neurotoxins, excitatory neurotransmitters, prostaglandin, reactive oxygen, and nitrogen species are secreted by activated microglia. In a murine model of JE, it was found that in the hippocampus and the striatum, the number of activated microglia was more than anywhere else in the brain closely followed by that in the thalamus. In the cortex, the number of activated microglia was significantly less when compared with other regions of the mouse brain. An overall induction of differential expression of proinflammatory cytokines and chemokines from different brain regions during a progressive Japanese Encephalitis infection was also observed. Although the net effect of the proinflammatory mediators is to kill infectious organisms and infected cells as well as to stimulate the production of molecules that amplify the mounting response to damage, it is also evident that in a nonregenerating organ such as the brain, a dysregulated innate immune response would be deleterious. In JE the tight regulation of microglial activation appears to be disturbed, resulting in an autotoxic loop of microglial activation that possibly leads to bystander neuronal damage. In animals, key signs include infertility and abortion in pigs, neurological disease in horses and systemic signs including fever, lethargy and anorexia. It is a disease caused by the mosquito-borne Japanese encephalitis virus (JEV). JEV is a virus from the family Flaviviridae, part of the Japanese encephalitis serocomplex of 9 genetically and antigenically related viruses, some which are particularly severe in horses, and four known to infect humans including West Nile virus. The enveloped virus is closely related to the West Nile virus and the St. Louis encephalitis virus. The positive sense single-stranded RNA genome is packaged in the capsid which is formed by the capsid protein. The outer envelope is formed by envelope protein and is the protective antigen. It aids in entry of the virus into the inside of the cell. The genome also encodes several nonstructural proteins (NS1, NS2a, NS2b, NS3, N4a, NS4b, NS5). NS1 is produced as secretory form also. NS3 is a putative helicase, and NS5 is the viral polymerase. It has been noted that Japanese encephalitis infects the lumen of the endoplasmic reticulum (ER) and rapidly accumulates substantial amounts of viral proteins. Based on the envelope gene, there are five genotypes (I–V). The Muar strain, isolated from a patient in Malaya in 1952, is the prototype strain of genotype V. Genotype IV appears to be the ancestral strain, and the virus appears to have evolved in the Indonesian–Malaysian region. The first clinical reports date from 1870, but the virus appears to have evolved in the mid-16th century. Over sixty complete genomes of this virus had been sequenced by 2010. Japanese encephalitis is diagnosed by commercially available tests detecting JE virus-specific IgM antibodies in serum and /or cerebrospinal fluid, for example by IgM capture ELISA. JE virus IgM antibodies are usually detectable 3 to 8 days after onset of illness and persist for 30 to 90 days, but longer persistence has been documented. Therefore, positive IgM antibodies occasionally may reflect a past infection or vaccination. Serum collected within 10 days of illness onset may not have detectable IgM, and the test should be repeated on a convalescent sample. For patients with JE virus IgM antibodies, confirmatory neutralizing antibody testing should be performed. Confirmatory testing in the US is only available at CDC and a few specialized reference laboratories. In fatal cases, nucleic acid amplification, and virus culture of autopsy tissues can be useful. Viral antigen can be shown in tissues by indirect fluorescent antibody staining. Infection with Japanese encephalitis confers lifelong immunity. There are currently three vaccines available: SA14-14-2, IC51 (marketed in Australia and New Zealand as JESPECT and elsewhere as IXIARO) and ChimeriVax-JE (marketed as IMOJEV). All current vaccines are based on the genotype III virus. A formalin-inactivated mouse-brain derived vaccine was first produced in Japan in the 1930s and was validated for use in Taiwan in the 1960s and in Thailand in the 1980s. The widespread use of vaccine and urbanization has led to control of the disease in Japan, Korea, Taiwan, and Singapore. The high cost of this vaccine, which is grown in live mice, means that poorer countries have not been able to afford to give it as part of a routine immunization program. The most common adverse effects are redness and pain at the injection site. Uncommonly, an urticarial reaction can develop about four days after injection. Vaccines produced from mouse brain have a risk of autoimmune neurological complications of around 1 per million vaccinations. However where the vaccine is not produced in mouse brains but in vitro using cell culture there is little adverse effects compared to placebo, the main side effects are headache and myalgia. The neutralizing antibody persists in the circulation for at least two to three years, and perhaps longer. The total duration of protection is unknown, but because there is no firm evidence for protection beyond three years, boosters are recommended every three years for people who remain at risk. Furthermore, there is also no data available regarding the interchangeability of other JE vaccines and IXIARO. In September 2012 the Indian firm Biological E. Limited has launched an inactivated cell culture derived vaccine based on SA 14-14-2 strain which was developed in a technology transfer agreement with Intercell and is a thiomersal-free vaccine. There is no specific treatment for Japanese encephalitis and treatment is supportive, with assistance given for feeding, breathing or seizure control as required. Raised intracranial pressure may be managed with mannitol. There is no transmission from person to person and therefore patients do not need to be isolated. A breakthrough in the field of Japanese encephalitis therapeutics is the identification of macrophage receptor involvement in the disease severity. A recent report of an Indian group demonstrates the involvement of monocyte and macrophage receptor CLEC5A in severe inflammatory response in Japanese Encephalitis infection of the brain. This transcriptomic study provides a hypothesis of neuroinflammation and a new lead in development of appropriate therapeutic against Japanese encephalitis. 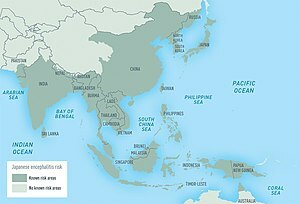 Japanese encephalitis (JE) is the leading cause of viral encephalitis in Asia, with up to 70,000 cases reported annually. Case-fatality rates range from 0.3% to 60% and depend on the population and age. Rare outbreaks in U.S. territories in the Western Pacific have also occurred. Residents of rural areas in endemic locations are at highest risk; Japanese encephalitis does not usually occur in urban areas. Countries which have had major epidemics in the past, but which have controlled the disease primarily by vaccination, include China, South Korea, Japan, Taiwan and Thailand. Other countries that still have periodic epidemics include Vietnam, Cambodia, Myanmar, India, Nepal, and Malaysia. Japanese encephalitis has been reported in the Torres Strait Islands and two fatal cases were reported in mainland northern Australia in 1998. There were reported cases in Kachin State, Myanmar in 2013. The spread of the virus in Australia is of particular concern to Australian health officials due to the unplanned introduction of Culex gelidus, a potential vector of the virus, from Asia. However, the current presence on mainland Australia is minimal. There had been 116 deaths reported in Odisha's backward Malkangiri district of India in 2016. Human, cattle, and horses are dead-end hosts as the disease manifests as fatal encephalitis. Pigs act as an amplifying host and have a very important role in the epidemiology of the disease. Infection in swine is asymptomatic, except in pregnant sows, when abortion and fetal abnormalities are common sequelae. The most important vector is Culex tritaeniorhynchus, which feeds on cattle in preference to humans. The natural hosts of the Japanese encephalitis virus are birds, not humans, and many believe the virus will therefore never be completely eliminated. In November 2011, the Japanese encephalitis virus was reported in Culex bitaeniorhynchus in South Korea. Recently whole genome microarray research of neurons infected with the Japanese Encephalitis virus has shown that neurons play an important role in their own defense against Japanese Encephalitis infection. Although this challenges the long-held belief that neurons are immunologically quiescent, an improved understanding of the proinflammatory effects responsible for immune-mediated control of viral infection and neuronal injury during Japanese Encephalitis infection is an essential step for developing strategies for limiting the severity of CNS disease. A number of drugs have been investigated to either reduce viral replication or provide neuroprotection in cell lines or studies upon mice. None are currently advocated in treating human patients. The use of rosmarinic acid, arctigenin, and oligosaccharides with degree of polymerization 6 from Gracilaria sp. or Monostroma nitidum have been shown to be effective in a mouse model of Japanese encephalitis. Curcumin has been shown to impart neuroprotection against Japanese Encephalitis infection in an in vitro study. Curcumin possibly acts by decreasing cellular reactive oxygen species level, restoration of cellular membrane integrity, decreasing pro-apoptotic signaling molecules, and modulating cellular levels of stress-related proteins. It has also been shown that the production of infective viral particles from previously infected neuroblastoma cells are reduced, which is achieved by the inhibition of ubiquitin-proteasome system. Minocycline in mice resulted in marked decreases in the levels of several markers, viral titer, and the level of proinflammatory mediators and also prevents blood brain barrier damage. ^ a b c d e f g "Symptoms and Treatment". CDC. August 2015. Archived from the original on 17 June 2017. Retrieved 29 October 2017. ^ a b c d e f g h i j k l m n o p q "Japanese encephalitis". World Health Organization. December 2015. Archived from the original on 13 July 2017. Retrieved 29 October 2017. ^ a b "Japanese Encephalitis". CDC. August 2015. Archived from the original on 24 May 2017. Retrieved 29 October 2017. ^ Moloney, Rachael M.; Kmush, Brittany; Rudolph, Kara E.; Cummings, Derek A. T.; Lessler, Justin (7 May 2014). "Incubation Periods of Mosquito-Borne Viral Infections: A Systematic Review". The American Journal of Tropical Medicine and Hygiene. 90 (5): 882–891. doi:10.4269/ajtmh.13-0403. PMC 4015582. PMID 24639305. ^ Simon, LV; Kruse, B (January 2018). Encephalitis, Japanese. PMID 29262148. ^ Ghoshal, A; Das, S; Ghosh, S; Mishra, MK; Sharma, V; Koli, P; Sen, E; Basu, A. (2007). "Proinflammatory mediators released by activated microglia induces neuronal death in Japanese encephalitis". Glia. 55 (5): 483–96. doi:10.1002/glia.20474. PMID 17203475. ^ a b Japanese Encephalitis Virus Archived 18 July 2013 at the Wayback Machine reviewed and published by WikiVet, accessed 11 October 2011. ^ a b Solomon, T. (2006). "Control of Japanese encephalitis – within our grasp?". New England Journal of Medicine. 355 (9): 869–71. doi:10.1056/NEJMp058263. PMID 16943399. ^ Lobigs M, Diamond MS (2012). "Feasibility of cross-protective vaccination against flaviviruses of the Japanese encephalitis serocomplex". Expert Rev Vaccines. 11 (2): 177–87. doi:10.1586/erv.11.180. PMC 3337329. PMID 22309667. ^ He B (March 2006). "Viruses, endoplasmic reticulum stress, and interferon responses". Cell Death Differ. 13 (3): 393–403. doi:10.1038/sj.cdd.4401833. PMID 16397582. ^ Su HL, Liao CL, Lin YL (May 2002). "Japanese encephalitis virus infection initiates endoplasmic reticulum stress and an unfolded protein response". J. Virol. 76 (9): 4162–71. doi:10.1128/JVI.76.9.4162-4171.2002. PMC 155064. PMID 11932381. ^ Shrivastva A, Tripathi NK, Parida M, Dash PK, Jana AM, Lakshmana Rao PV (2008). "Comparison of a dipstick enzyme-linked immunosorbent assay with commercial assays for detection of Japanese encephalitis virus-specific IgM antibodies". J Postgrad Med. 54 (3): 181–5. doi:10.4103/0022-3859.40959. PMID 18626163. ^ Schiøler KL, Samuel M, Wai KL (2007). "Vaccines for preventing Japanese encephalitis". Cochrane Database Syst Rev (3): CD004263. doi:10.1002/14651858.CD004263.pub2. PMID 17636750. ^ Jelinek T (July 2008). "Japanese encephalitis vaccine in travelers". Expert Rev Vaccines. 7 (5): 689–93. doi:10.1586/14760584.7.5.689. PMID 18564023. ^ Gambel JM, DeFraites R, Hoke C, et al. (1995). "Japanese encephalitis vaccine: persistence of antibody up to 3 years after a three-dose primary series (letter)". J Infect Dis. 171 (4): 1074. doi:10.1093/infdis/171.4.1074. PMID 7706798. ^ Kurane I, Takashi T (2000). "Immunogenicity and protective efficacy of the current inactivated Japanese encephalitis vaccine against different Japanese encephalitis virus strains". Vaccine. 18 (Suppl): 33–5. doi:10.1016/S0264-410X(00)00041-4. PMID 10821971. ^ "Jeev an inactivated Japanese Encephalitis vaccine launched in Hyderabad". pharmabiz.com. 15 September 2012. Archived from the original on 23 October 2012. Retrieved 11 January 2013. ^ Alison Bryant (17 September 2012). "Intercell's Jeev vaccine debuts in India". Archived from the original on 19 January 2013. Retrieved 11 January 2013. ^ Solomon T, Dung NM, Kneen R, Gainsborough M, Vaughn DW, Khanh VT (2000). "Japanese encephalitis". Journal of Neurology, Neurosurgery, and Psychiatry. 68 (9): 405–15. doi:10.1136/jnnp.68.4.405. PMC 1736874. PMID 10727474. ^ Nimesh Gupta; Vinay Lomash; P.V. Lakshmana Rao (September 2010). "Expression profile of Japanese encephalitis virus induced neuroinflammation and its implication in disease severity". Journal of Clinical Virology. 49 (1): 04–10. doi:10.1016/j.jcv.2010.06.009. PMID 20637688. ^ Nimesh Gupta; P.V. Lakshmana Rao (March 2011). "Transcriptomic profile of host response in Japanese encephalitis virus infection". Virology Journal. 8 (92): 92. doi:10.1186/1743-422X-8-92. PMC 3058095. PMID 21371334. ^ Campbell GL, Hills SL, Fischer M, Jacobson JA, Hoke CH, Hombach JM, Marfin AA, Solomon T, Tsai TF, Tsu VD, Ginsburg AS (November 2011). "Estimmated global incidence of Japanese encephalitis: a systematic review". Bull World Health Organ. 89 (10): 766–74. doi:10.2471/BLT.10.085233. PMC 3209971. PMID 22084515. ^ Ghosh D, Basu A (September 2009). Brooker S (ed.). "Japanese encephalitis-a pathological and clinical perspective". PLoS Negl Trop Dis. 3 (9): e437. doi:10.1371/journal.pntd.0000437. PMC 2745699. PMID 19787040. ^ Kim, Heung Chul; Terry A. Klein; Ratree Takhampunya; Brian P. Evans; Sirima Mingmongkolchai; Ampornpan Kengluecha; John Grieco; Penny Masuoka; Myung-Soon Kim; Sung-Tae Chong; Jong-Koo Lee & Won-Ja Lee (2011). "Japanese Encephalitis Virus in Culicine Mosquitoes (Diptera: Culicidae) Collected at Daeseongdong, a Village in the Demilitarized Zone of the Republic of Korea". Journal of Medical Entomology. 48 (6): 1250–1256. doi:10.1603/me11091. ^ Nimesh Gupta; S.R. Santhosh; J. Pradeep Babu; M.M. Parida; P.V. Lakshmana Rao (January 2010). "Chemokine profiling of Japanese encephalitis virus-infected mouse neuroblastoma cells by microarray and real-time RT-PCR: Implication in neuropathogenesis". Virus Research. 147 (1): 107–12. doi:10.1016/j.virusres.2009.10.018. PMID 19896511. ^ Swarup V, Ghosh J, Ghosh S, Saxena A, Basu A (September 2007). "Antiviral and anti-inflammatory effects of rosmarinic acid in an experimental murine model of Japanese encephalitis". Antimicrob. Agents Chemother. 51 (9): 3367–70. doi:10.1128/AAC.00041-07. PMC 2043228. PMID 17576830. ^ Swarup V, Ghosh J, Mishra MK, Basu A (March 2008). "Novel strategy for treatment of Japanese encephalitis using arctigenin, a plant lignan". J. Antimicrob. Chemother. 61 (3): 679–88. doi:10.1093/jac/dkm503. PMID 18230688. Archived from the original on 4 February 2010. ^ Kazłowski B, Chiu YH, Kazłowska K, Pan CL, Wu CJ (August 2012). "Prevention of Japanese encephalitis virus infections by low-degree-polymerisation sulfated saccharides from Gracilaria sp. and Monostroma nitidum". Food Chem. 133 (3): 866–74. doi:10.1016/j.foodchem.2012.01.106. ^ Dutta K, Ghosh D, Basu A (May 2009). "Curcumin Protects Neuronal Cells from Japanese Encephalitis Virus-Mediated Cell Death and also Inhibits Infective Viral Particle Formation by Dysregulation of Ubiquitin-Proteasome System". J Neuroimmune Pharmacol. 4 (3): 328–37. doi:10.1007/s11481-009-9158-2. PMID 19434500. ^ Mishra MK, Basu A (June 2008). "Minocycline neuroprotects, reduces microglial activation, inhibits caspase 3 induction, and viral replication following Japanese encephalitis". J. Neurochem. 105 (5): 1582–95. doi:10.1111/j.1471-4159.2008.05238.x. PMID 18208541. ^ Mishra MK, Dutta K, Saheb SK, Basu A (December 2009). "Understanding the molecular mechanism of blood–brain barrier damage in an experimental model of Japanese encephalitis: correlation with minocycline administration as a therapeutic agent". Neurochem Int. 55 (8): 717–23. doi:10.1016/j.neuint.2009.07.006. PMID 19628016. ^ Mohammed MA, Galbraith SE, Radford AD, Dove W, Takasaki T, Kurane I, Solomon T (July 2011). "Molecular phylogenetic and evolutionary analyses of Muar strain of Japanese encephalitis virus reveal it is the missing fifth genotype". Infect Genet Evol. 11 (5): 855–62. doi:10.1016/j.meegid.2011.01.020. PMID 21352956. Simon, LV; Kruse, B (January 2018). 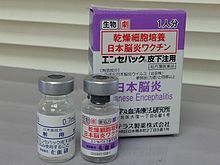 Encephalitis, Japanese. FL: StatPearls Publishing. PMID 29262148. This page was last edited on 16 April 2019, at 04:55 (UTC).